I was lucky enough to catch the Silver Apples show last night in Detroit, and although Simeon is the only remaining member of the former duo, he is equally creative today as he was in the late 1960s. At one point during his set, he tuned into random local radio stations and incorporated beats into the broadcasts. The only disappointing aspect of the new live show is the lack of drums. In order to tour solo, Simeon has reworked all the old recordings, replacing the live drums with a techno beat, making it feel more like a rave. There was also some top-notch merch. I was able to pick up their out-of-print 1996 Fractal Flow/Lovefingers 7'', and the album I'm posting. 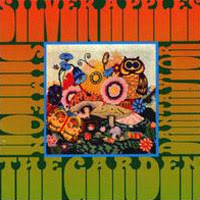 The Garden is a collection of 7 tracks recorded in 1969 for their third album that would ultimately be botched by Whirlybird Records, and 7 tracks recorded by drummer Danny Taylor in 1968 with additional electronic "noodles" added by Simeon in 1998. The final product, officially released in 1998, is some of the bands greatest work, and is virtually impossible to come across on the internet. The 7 tracks recorded in 1969, including a pretty sweet cover of "Mustang Sally", makes this an essential download. I want to hear this so badly. The link is leading to an error. is there possible to fix the link, please ? really love to have this one.